I think a lot of online manual advocates have no plans to buy any of these cars in the first place, and just work backwards to create a narrative to justify their decision. Outstanding; a study about me. It shouldn't be a mystery that consumers amongst whom more choice is generally regarded as good would generally regard the deletion of the simpler and less expensive option as bad. Unofficial Feelings Manager for OT. I thought that I wanted to buy a new 2018 base 6 until I drove one. Despite being the supposedly sporty option in its class, the seats are so flat that they might as well be a bench and the driver's seat bottom is so high off the floor that it feels like an old Buick. The car itself handles well, looks good, is nicely equipped and priced... But that seating ruined it. My old man Lincoln has more sporty seats and a more sporty seating position. Either that, or the continuing reduction in models offering a manual option leads them to believe that they'll be left with no option but to take an automatic at some point. Which isn't what they want. I'm shocked anyone still offers a manual transmission in this class of car. I wouldn't have bought a 6 with a manual because that'd mean not getting the 2.5T and nicer interior features/appointments. And it's clear 99% of other purchasers don't care either. When I was in my early 20's, a manual transmission was a top 3 want. A big part of that was because the manual got the most out of small 4cyl motors, and it usually cost a GRAND less than the automatic version. Now that I'm in my very late 40's, it's about #15 on my list of wants/needs. A big part of that is because the manuals aren't even offered in a lot of cars I like, and modern automatics are so much better than they used to be. Seems a manual will always stick around in real sports cars, so I'm good with that. I can't say I'm upset about this, it's Mazda's Camcord. If they stopped making the Miata in stick, now that would be unsettling news. The 6 really is a very pretty sedan though, a standout visually in this segment imo. The interior also punches above its class, with a clean design and top notch materials. Mazda's automatic is a really good one (not a CVT) and well matched to the current 2.5 engine. Honestly, these are good cars that probably should be selling better than they do. Given that the Manual was only available on the base "sport" trim, I doubt this move effects sales at all in the long run. Sad but not totally unexpected. I was actually surprised when the 2013 Mazda6 had a manual. Not sure if this is directed at me, but fwiw, hands down the 6 would be my choice in the Camcord segment. I just think this will affect a small percentage of those buyers, whereas for the Miata it's probably more than half. Honestly, these are good cars that probably should be selling better than they do. Sadly, I think this is true for Mazda's entire lineup. It's a sad truth that superior marketing can at times beat superior design and engineering. Last edited by ghost03; 03-29-2019 at 01:24 PM. Modern autos are quite good these days, with some exceptions (Ford DCT, I'm looking at you.) Sometimes it does, simply, come down to personal choice. That's all. No agendas, no crazy rationalizations, some people just like manuels for whatever reason they have. I'm one. I'd buy another manual given the choice, but if my next vehicle that suits my needs and wants had an auto, so be it. Not transmission related, but I concur. In this generation and the prior one, Mazda used creases in the sheet metal to make the basic box shape less boxy, prettier and better proportioned. The prior generation was probably better at this. On the other hand, many competitor designs look as if someone made a car and an editor said "We need MORE creases!". MB and Hyundai put out some rough looking sedans. They claim to use more clay than anyone else, and thus, more "handmade" design. If that's true, I think it shows. Even with the black plastic in the front, I still say Mazda made the best looking hatchback overall. Last edited by ForTheWin; 03-29-2019 at 02:12 PM. Even with the black plastic in the front, I still say Mazda bade the best looking hatchback overall. I thought about a Mazda3 for a while. The basic shape isn't great; the hood looks long in a way that seems pre-modern and the roof is a bit low, but the notable thing about its appearance is the way the whole thing tied together. In contrast, I would describe a lot of auto styling of the past decade as not just busy, but also disjointed. How a car is styled may be amongst the least important of its attributes to its driver, but Mazda is due a compliment for its good work. 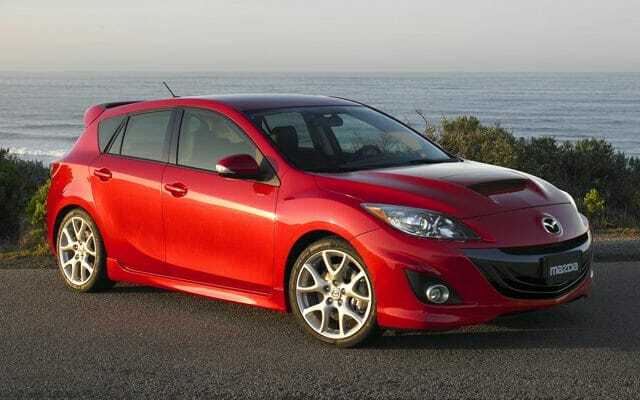 Same with the Mazdaspeed 3. Agreed on all counts there. The cars are reliable, beautiful and great to drive. But Mazda still suffers from sparse dealership networks and a general lack of brand recognition. It is what it is. They are still around, available and doing OK. About all I can realistically ask for. Honda will be happy to sell you an Accord Sport with a 1.5T or a 2.0T. couldn't agree more. Dare I say it's the only conventional automatic worth a damn in an affordable car? It's quick, yet it's smooth, and yet it has a torque converter. It puzzles me how other manufacturers haven't made something similarly good. And I have no idea why these cars don't sell better than they do. They drive so well, and are now quite comfy too. Back in the day you could get a manual for a couple grand less. The automatics would always shift all over the place and be in the wrong gear, hence it was better to row your own. Thieves and people that want to drive your car don't know how to drive stick either. 1) You guys must know a few people who have been driving automatics for years, but say they'd like to have a manual again, right? They keep saying this, and yet they keep buying ****ing automatics. If all of the people who say they want a manual again and are able would buy them new, the manual transmission wouldn't be in an iron lung. 2) All too many enthusiasts who do buy manuals only buy them used. You talk about depreciation hits? Look at your interest rate. 3) I'd be more than happy to accept a market reality of manual transmissions being a cost option, reversing what used to be the case. Again, this would require both enthusiasts and regular consumers who say they'd like a manual to actually buy them... New. I have had a manual for all my life, but after driving my mom's Mazda 3 with the 6 speed auto, I don't think I would care if I had to scrap the manual. It's that good. Last edited by esrballa; 03-29-2019 at 11:55 PM.